Lipofibromatous Hamartoma (LFH) of the nerve is a rare tumour-like condition involving the peripheral nerves, most commonly in the upper extremity with a predilection for the median nerve. It is almost always described in children and young adults. The lesion is sometimes associated with macrodactyly and lipomatous macrodystrophy of muscles and subcutaneous fat in the region supplied by the nerve. The characteristic enlargement of the affected nerve trunk is caused by the proliferation of the epineural adipose tissue associated with perineural fibrosis. Five cases of LFH of the median nerve sent for histopathological examination from July 1991 to June 2011 were retrieved from the departmental records maintained in our institute. The H&E stained paraffin sections were reviewed for the histomorphological features. Case 1: A 30-year-old woman presented with a fiveyear history of swelling in the left hand and wrist. On examination she had features of carpal tunnel syndrome. On surgical exploration the carpal tunnel was tight and showed thickened median nerve from eight centimeters above the wrist joint. The carpal tunnel was decompressed and the thickened nerve sheath relieved. A biopsy was sent for histopathology. Case 2: An 18-year-old girl presented with complaints of insidious onset of pain and swelling in the right hand of one month duration associated with macrodactyly of ring finger which was present since childhood. On examination, there was diffuse swelling in the ventral aspect of the forearm and hand along with enlargement of the ring finger (Figure 1). There was no neurological deficit. On exploration, the mass was seen to arise from the median nerve (Figure 2). Click Here to Zoom Figure 1: An 18-year-old girl presented with diffuse swelling in the ventral aspect of the hand and enlargement of the ring finger. Click Here to Zoom Figure 2: Intraoperatively a mass was seen to arise from the median nerve. Case 3: A 28-year-old woman came to the orthopedic outpatient department with an insidious history of swelling in the right hand and forearm associated with macrodactyly of thumb and index finger since birth. On examination she had diffuse swelling in the volar aspect of the right hand, macrodactyly of thumb and index finger. There was ventral angulation and deformity of the index finger. The movements of the wrist joint, the index finger and thumb were slightly limited and mildly painful when forced. Surgical exploration with decompression of the median nerve and excision of the mass involving the digital nerve of the index finger was done. The right index finger was then reconstructed. Case 4: A 16-year-old girl presented with a history of progressively increasing swelling in the right hand and forearm associated with macrodactyly of thumb since birth. On examination, the right hand showed a diffuse mass in the ventral aspect of the forearm, wrist and thenar region along with enlargement of the thumb. There was no neurological deficit. Fibrofatty tissues were dissected and removed from the nerve. The result of surgical debulking was satisfactory. Post-operatively there was no change in function or recurrence of the mass. Case 5: A 30-year-old man presented with complaints of swelling in the right forearm of six years duration associated with intermittent pain. On examination, there was diffuse swelling in the ventral aspect of the forearm. There was no neurological deficit. On exploration, an oval bright yellow mass was seen to arise from the median nerve. The fibrofatty sheath was decompressed and the mass was excised. The case histories and clinical findings of the five patients are summarized in Table I.
Histopathological findings: The H&E stained slides of all the lesions showed fibrofatty tissue surrounding and infiltrating along the epineurium and perineurium (Figure 3). The nerve bundles were splayed apart by the infiltrating mature adipose tissue (Figure 4). Perineural fibrosis was identified in four cases and focal myxoid change was seen in one case. Immunohistochemical staining with S 100 protein in one of the case showed strong positivity of the nerve fibres (Figure 5). All lesions were diagnosed as lipofibromatous hamartoma of the median nerve. Click Here to Zoom Figure 3: Section shows fibrofatty tissue surrounding and infiltrating along the epineurium and perineurium. (H&E; x100). Click Here to Zoom Figure 4: Section shows nerve bundles splayed apart by the infiltrating mature adipose tissue. (H&E; x100). Click Here to Zoom Figure 5: Section shows cross section of nerve bundle with perineural proliferation and strong immunoreactivity of the Schwann cells for S 100. (S100; x200). Lipofibromatous hamartoma of the nerve is an uncommon neural non-neoplastic lesion demonstrating gross enlargement of a nerve caused by epineural and perineural proliferation of fibrofatty tissue1-5. Less than 100 cases of LFH affecting the median nerve have been documented, of which about one-fourth were associated with true macrodactyly in the territory of the nerve distribution, predominantly in females3. We present five more cases of lipofibromatous hamartoma of the median nerve occurring in four women and one man. Three of these cases had associated macrodactyly. Numerous synonyms have been used for describing this condition, the most common ones being neural fibrolipoma, neural fibrolipomatosis, neural lipofibroma, neural lipomatous hamartoma, neural fibrolipomatous hamartoma, fatty infiltration of nerve and fibrofatty proliferation of peripheral nerve3-9. This uncommon benign slow growing lesion with an indolent course was first reported by Mason in 19536. This was followed by two cases of diffuse fibrofatty overgrowth involving the adipose tissue of the median nerve published by Mikhail in 19647. One was a case of macrodystrophia lipomatosa of the thumb and index finger with a marked fibrofatty infiltration of the median nerve and its digital branches to the thumb and index finger. The other was termed fibrolipoma of the median nerve trunk. Yeoman reported three patients with fatty infiltration of the median nerve and stated that the intimate association of the fibrofatty tissue within the nerve precluded enucleation of the swelling8. Johnson and Bonfiglio in 1969 reviewed the literature and put up a case of their own with detailed histological account of the lesion and coined the term lipofibromatous hamartoma of nerve, which aptly fits the microscopic description9. In our series there was 100% involvement of the median nerve, four of the five cases were in women, three had macrodactyly, and the age range at presentation varied from 16 to 30 years. Approximately, 80% of these lesions originate in the distribution of the median nerve with a predilection for the carpel tunnel1-12. Other reported sites of involvement include the ulnar nerve2,11,13-15, radial nerve16, nerves of the foot3, brachial plexus, and cranial nerves17. Patients commonly present within the first three decades of life with few reports in children that are considered congenital by some authors8,9,14. The female: male ratio is approximately 2:114. 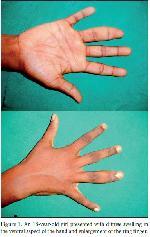 The most common presentation of LFH is a mass or swelling on the volar aspect of the wrist or distal forearm. Neural fibrolipomatous hamartoma can be asymptomatic or accompanied by pain; there may be local motor or sensory symptoms, and late compression neuropathy. Macrodactyly is seen in 25 to 60 percent of patients with LFH and is most often congenital2,3,14. Macrodactyly was present in three of our cases, was congenital in two and seen from childhood in one. Two of our patients presented with tingling and paraesthesia along the distribution of the median nerve in the hand predominantly affecting the palmar aspect of thumb and index finger. Neural fibrolipoma is an orange- yellow, fusiform, sausage like or ropelike enlargement of the nerve3,4,10,11,18. The sheath of the nerve is shiny, intact and non-adherent, but thick, firm and non-resilient as in case 1 in this study. The nerves may be markedly increased in length and diameter in the involved area4. Preoperative diagnosis is made by Magnetic Resonance Imaging (MRI) where the lesion produces the characteristic feature known as the cable sign5. The thickened nerve bundles surrounded by uniformly distributed fat appear as serpentine, low intensity structures encircled by high intensity signal giving rise to the cable like appearance in the axial plane and a spaghetti- like or strands of hair appearance in the coronal plane1. Electromyography and nerve conduction studies can show prolonged latency of sensory or motor innervations and fibrillations in distal muscles to confirm a compressive myopathy4,14. None of our patients had undergone MRI evaluation. Morphology remains the mainstay of diagnosis and immunohistochemistry does not aid in the diagnosis of these lesions. The Schwann cells typically are strongly positive for S 100 protein and myelin in the nerve fibres show intense positivity for basic myelin protein. The perineural cells stain positive for epithelial membrane antigen17,18. Lipofibromatous Hamartoma is considered to be a hamartoma because of the overgrowth of the normal connective tissue components: fat and fibrous tissue15,17. On microscopic examination, a fibrofatty expansion of the epineural space is seen with splaying of the nerve bundles. Perineural fibrosis and endoneural fibrosis may be seen. Occasionally, in long standing lesions, metaplastic bone is found in the fibrofatty tissue1,2. The differential diagnosis of LFH on histopathology includes neural lipomas, diffuse lipomatosis, neuromas and neurofibromas. Lipoma of the nerves is an encapsulated fatty proliferation encloses the nerve sheaths2,3. Histology clinches the diagnosis as there is no characteristic scattering of individual nerve fascicles within the fatty mass in these tumours2,3,17. In diffuse lipomatosis there is primary involvement of muscle and subcutis with the nerves being secondarily involved. Other differential diagnoses such as neuromas and neurofibromas can be ruled out by the absence of proliferation of the neural elements. Neural fibrolipomatous hamartoma is a benign condition. Treatment of LFH is directed towards management of the digital or soft tissue involvement and management of the enlarged nerve. The surgical management of this condition is controversial and most often involves conservative management with surgical exploration, biopsy and carpal tunnel release to decompress the nerve. The ideal plan is to release the fascia of the forearm, carpal tunnel, palm, or digit, as indicated by the location of the lesion1,3,10. The lesion can be debulked extensively to improve the functional status. Extensive microsurgical intraneural dissection can lead to significant ischemic complications12,14. Nerve fasciotomy with simple excision of fatty tissue and sparing of the nerve is the treatment of choice. Complete excision of a lipofibromatous hamartoma of the median nerve can result in disastrous loss of neurological function. Patients with macrodactyly or advanced disease may require debulking and reconstructive procedures aimed at improving hand function4. Awareness of this condition is crucial in order to avoid misdiagnosis on biopsy, which may result in a more drastic surgery. 1) Cui Q, Chhabra AB, Leo BM, Pannunzio ME. Lipofibromatous hamartoma of a digital nerve. Am J Orthop. 2008;37:146-8. 2) Silverman TA , Enzinger FM. Fibrolipomatous hamartoma of nerve: A clinicopathological analysis of 26 cases. Am J Surg Pathol. 1985;9:7-14. 3) Bisceglia M, Vigilante E, Ben-Dor D. Neural fibrolipomatous hamartoma: A report of two cases and review of the literature. Adv Anat Pathol. 2007;14:46-52. 4) R azzaghi A, Anastakis DJ. Lipofibromatous hamartoma: Review of early diagnosis and treatment. Can J Surg. 2005;48:394-9. 5) Berry MG, Malluci P, Banwell PE, Heywood AJ. Fibrolipoma of the median nerve. J R Soc Med. 1999;92:408-9. 6) Mason ML. Presentation of cases. Proceedings of the American Society of Surgery of the Hand. J Bone Joint Surg. 1953;35:273-5. 7) Mikhail IK. Median nerve lipoma in the hand. J Bone Joint Surg Br. 1964;46:726-30. 8) Yeoman PM. Fatty infiltration of the median nerve. J Bone Joint Surg Br. 1964;46:737-9. 9) Johnson RJ, Bonfiglio M. Lipofibromatous hamartoma of the median nerve. J Bone Joint Surg Am. 1969;51:984-90. 10) Canga A, Abascal F, Cerezal L, Bustamante M, Perez-Carro L,Vazquez-Barquero A. Fibrolipomatous hamartoma of the median nerve. J Neurosurg. 1998;89:683. 11) Patel ME, Silver JW, Lipton DE, Pearlman HS. Lipofibroma of the median nerve in the palm and digits of the hand. J Bone Joint Surg Am. 1979;61:393-7. 12) Houpt P, Storm van Leeuwen JB, van den Bergen HA. Intraneural lipofibroma of the median nerve. J Hand Surg Am. 1989;14: 706-9. 13) Gouldesbrough DR, Kinny SJ. Lipofibromatous hamartoma of the ulnar nerve at the elbow: Brief report. J Bone Joint Surg Br. 1989;71:331-2. 14) A madio PC, Reiman HM, Dobyns JH. Lipofibromatous hamartoma of the nerve. J Hand Surg Am. 1988;13:67-75. 15) Warhold LG, Urban MA, Bora FW, Brooks JSJ, Peters SB. Lipofibromatous hamartomas of the median nerve. J Hand Surg Am. 1993;18:1032-7. 16) Jacob RA , Buchino JJ. Lipofibroma of the superficial branch of the radial nerve. J Hand Surg Am. 1989;14:704-6. 17) Berti E, Roncaroli F. Fibrolipomatous hamartoma of a cranial nerve: Brief Report. Histopathology. 1994;24:391-2. 18) Ulrich D, Ulrich F, Schroeder M, Pallau N. Lipofibromatous hamartoma of the median nerve in patients with macrodactyly: Diagnosis and treatment of a rare disease causing carpal tunnel syndrome. Arch Orthop Trauma Surg. 2009;129:1219-24.